The latest project from Dreadnought South West is a new play, The Orchard, that imagines a meeting between radical suffragette Emmeline Pankhurst and moderate suffragist Millicent Fawcett. We might be back in similar territory to their last piece, Oxygen, which in 2013 celebrated the centenary of the Great 1913 Suffrage Pilgrimage, but this time the work is more clearly untethered from its historical moorings. The conversation between Emmeline and Millicent draws on history and yet feels so very contemporary, in that we're still - 100-odd years on - debating the same issues around equality, democracy, women in politics and the vote. With Emmeline on the run from the authorities - she's recently been released from prison, where she'd been on hunger strike - she and Millicent seek somewhere safe to talk, away from the glare. An orchard in spring - life blooming all around them. And here they discuss their politics, their commitment to the cause - equality for women - and their very different approaches to achieving their aims. Militancy, window-smashing, bombs... Emmeline believes that only radical action can make the government listen; for Millicent, persistent, consistent peaceful campaigning is the only reasonable route to take. As Emmeline and Millicent, actors Ruth Mitchell and Michelle Ridings interrogate each other's position as the audience sits in traverse, eyeing each other as much as the performers. It's like a debating chamber, the House of Commons - the action playing out before us, the debate constantly moving forward, digging ever deeper into what it means to stand up for one's convictions, fight for one's beliefs, do what needs to be done to achieve one's aims. 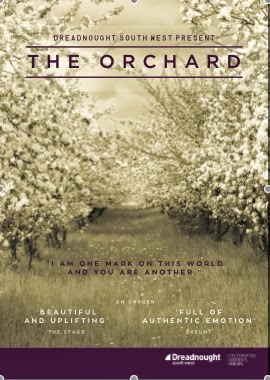 This might be a peaceful orchard, blossom all around, but the arguments are vital and throb with passion. And what's most exciting is that this process is a truly collaborative creative endeavour, involving the actors, playwright Natalie McGrath and director Josie Sutcliffe, as well as the audience - after each performance, the audience is invited to discuss what they've seen, share their thoughts and ideas, and these conversations then feed into the development of the script, altering it, shaping it, making it afresh every performance. It's a living thing that grows each time it is shared; the more people see it, the more voices that add to its development, the more representative it will be of what we really want to talk about, as theatregoers, as citizens, as voters about to throw our two-penneth into the big election hat. Theatre doesn't get much more exciting than that.